We Can Make It Better! 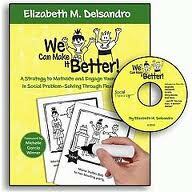 Strategies to Motivate and Engage Young Learners in Social Problem-Solving Through Flexible Stories by Elizabeth M. Delsandro. Students develop a connection to the characters in the authors’ stories and are earger to learn about the new adventures. This entry was posted in Our Library, Social Skills, Social Stories and tagged Autism Spectrum Disorder, books, social skill. Bookmark the permalink.